Maxisorp ELISA 96-well plates were coated with various concentrations of TrkBECD-Fc, 20 mg/ml BSA, or 1 mg/ml IgG-Fc in a carbonate buffer (pH 9.6) overnight at 4°C. Plates were saturated with 0.5% BSA in PBS for 2 hours at room temperature and extensively washed in PBS-Tween 0.05%. Bodipy–ANA-12 was then incubated in 0.5% PBS-BSA for 1 hour at room temperature before the addition of BDNF in 0.5% PBS-BSA for another hour. After extensive washes in PBS-Tween 0.05%, the amount of bodipy–ANA-12 bound was quantified by fluorescence at 520 ± 10 nm. In the TrkB-expressing cells, ANA-12 prevented brain-derived neurotrophic factor-induced neurite outgrowth at concentrations as low as 10 nM. At concentrations up to 10–100 μM, ANA-12 completely abolished the effects of brain-derived neurotrophic factor, and no single neurite or branching could be observed. Mice administered ANA-12 demonstrated reduced anxiety- and depression-related behaviors on a variety of tests predictive of anxiolytic and antidepressant properties in humans. Cazorla M, Prémont J, Mann A, et al. Identification of a low-molecular weight TrkB antagonist with anxiolytic and antidepressant activity in mice. J Clin Invest, 2011, 121(5): 1846-1857. 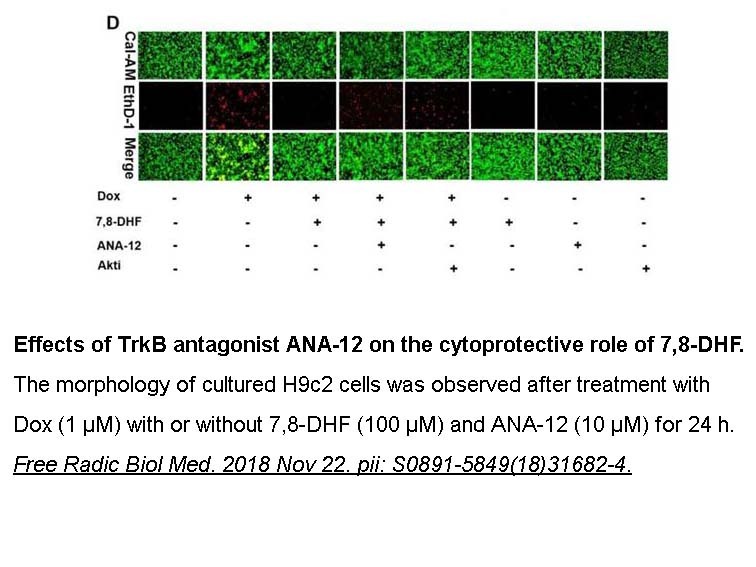 ANA 12 is a potent and selective antagonist of TrkB with IC50 values of 45.6 nM and 41.1 μM for the high and low affinity sites, respectively . Tropomyosin-related kinase B (TrkB) is a receptor for brain-derived neurotrophic factor (BDNF) and neurotrophin-4/5 (NT-4/5) and activates 3 major signaling pathways involving phospholipase C-γ, PI3K and MAPK. 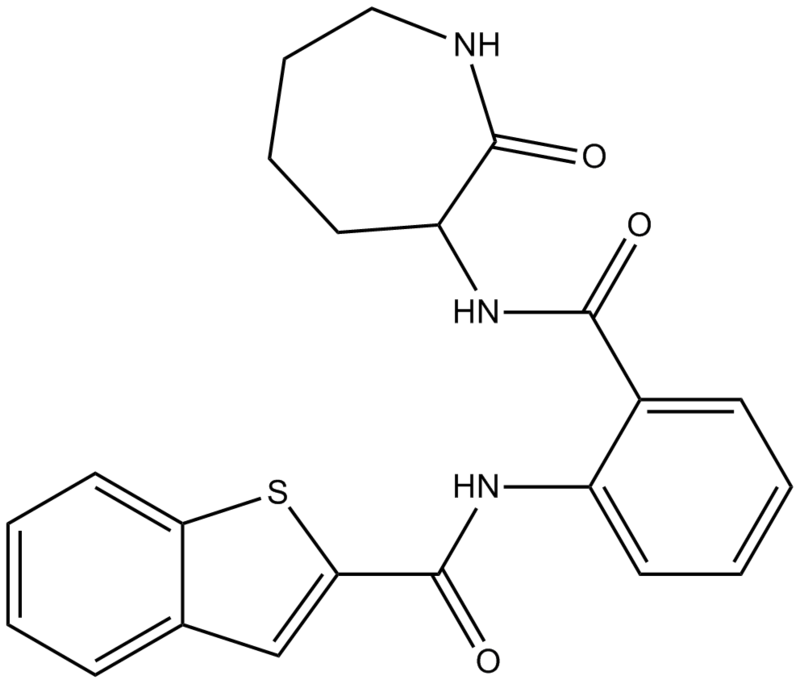 The BDNF/TrkB signaling plays an important role in drug addiction, depression and anxiety . ANA 12 is a potent and selective TrkB antagonist. ANA-12 bound to the extracellular low-affinity site of TrkB with Kd value of 12 μM in a dose-dependent way. And ANA-12 bound to the high-affinity site with Kd value of 10 nM. Also, ANA-12 bound to TrkB in a noncompetitive mechanism. In the TrkB-expressing cells, ANA-12 (10 nM) effectively inhibited BDNF-induced neurite outgrowth and completely abolished the effects of BDNF at 10-100 μM . In the mice brain, ANA-12 (0.5 mg/kg) inhibited endogenous TrkB activity by 25% 4 hours later. Also, ANA-12 showed antidepressant and anxiolytic activities .
. Cazorla M, Prémont J, Mann A, et al. Identification of a low-molecular weight TrkB antagonist with anxiolytic and antidepressant activity in mice. J Clin Invest, 2011, 121(5): 1846-1857.